Folic acid helps your body produce and maintain new cells, and also helps prevent changes to DNA that may lead to cancer. 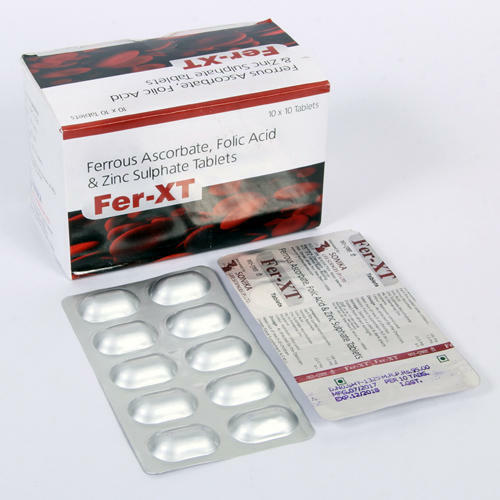 Ferrous sulfate and folic acid is used to treat iron deficiency anemia (a lack of red blood cells caused by having too little iron in the body). Incepted in the year 2011, at Manimajra (Chandigarh, India), we, “Sonika Life SciencesLimited”, are a coveted organization that in engaged in manufacturing, trading, exporting and supplying of an unbeatable range of Pharmaceutical Products and Surgical Equipment. Our offered range comprises Dietary Supplements, Lycopene Syrups, Lycopene Capsules, B Complex Syrups, Liver Tonic, Enzyme Syrups, Antibiotics Medicines, Ginseng Capsules, Pharmaceutical Tablets, Prebiotic & Probiotic Capsules, Ointment Cream & Gel, Dry Syrups, Methylcobamin Capsules & Tablets, Protien Powders, Pharmaceutical Injections, Suction Units, OT LED Light & Electro Surgical, Mediaid Monitoring Equipment, Sure Seal Vessel Sealing Systems and many more. The entire range of product is manufactured using quality-approved raw material, which is highly demanded in the market by our esteemed clients. All our products are available in varied sizes, designs and technical specifications, which make them suitable to be use by our valuable clients. Our diligent manufacturers make use of latest engraving machines and technologies in order to provide defect-free products to the clients. All our products are widely applauded by the clients for their longer service life, sturdy construction, portability and shock proof nature.